The company operates multiple locations in the United States and one in Mexico. One site in the USA was operating at maximum capacity. Due to issues beyond its control, this facility saw an increase in castings that failed leak test. With this increase in fallout their vacuum impregnation hit full utilization, and more capacity was needed. Outsourcing-The company considering outsourcing excess requirements to an impregnation service center. After evaluating the logistics costs, and the quality risks associated with two supply lines, outsourcing was quickly discarded. Purchasing a New Vacuum Impregnation System-Lead times made buying a new system unfeasible and the cost would be prohibitive, especially for what may be a temporary problem. Recommissioning a Used Batch System-Purchasing, moving and recommissioning a nearby used batch impregnation system would be no simple task. It required weeks of planning and alterations in infrastructure for equipment pits, platforms and overhead cranes. That was not an option, time was of the essence. The facility in Mexico had a delay in a product launch, which led to idle capacity. This inactive impregnation system was what was needed in the USA. Most discounted this option as far too complicated given customs, border crossings and transportation. Fortunately, the company standardized on Godfrey & Wing’s lean front-loading vacuum impregnation systems. The USA facility operated a fully automated Continuous Flow impregnation (CFi) system and the Mexico facility employed two High Value Low Volume (HVLV) systems (Image 1). The CFi is a lean, front loading vacuum impregnation system that uses a robot for part handling and transfers between modules. 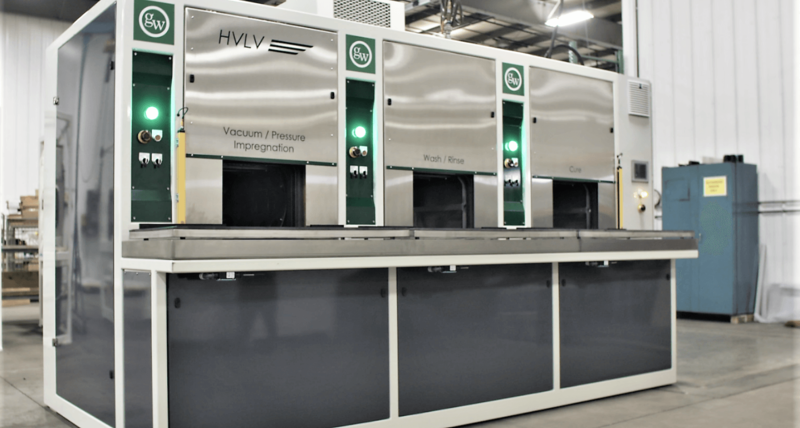 The HVLV is the same impregnation technology but utilizes automated process control and manual material handling. Image 1: The HVLV is a front loading system that uses automated process control and manual material handling. Despite initially discounting moving an HVLV system from Mexico, the customer’s operations team decided this was the best option and quickly started assembling data. No Infrastructure Changes-The HVLV system did not require infrastructure changes. Modular Footprint-With a footprint of 96 square feet the HVLV system was easily transportable and did not require riggers and special handling equipment. No Interconnecting Wires-It would be a fast de-commission and a “plug and play” installation. No interconnecting wires needed to be removed or reinstalled. Single point connections for electricity, water and air were standard on the HVLV (Image 2). Easy Customer Approval-Customer approvals would be easy as the HVLV used the same impregnation process as the CFI. No Quality Issues-Quality was not a concern as the wash and cure stations in the CFi and HVLV were identical. Image 2: The HVLV requires no interconnecting wires to be removed or reinstalled. The team reached the conclusion that shipping the idle vacuum impregnation system from Mexico was the best solution to the capacity problem in the USA. Within three hours on a Friday morning, the HVLV was decommissioned and placed on a truck. The unit arrived at its USA destination, 1700 miles away, on Monday, qualified on Tuesday, and was sealing parts on Wednesday. Increased Throughput-Operating the HVLV alongside the CFi increased throughput by 40%, easily accommodating the spike in requirements (Image 3). Minimal Installation and Shipping Costs-The HVLV was transported and installed for $11,000. This represents less than one week of freight costs if the parts were outsourced. Piece Cost- The HVLV system was the least expensive option of the three considered. Image 3: The HVLV easily accommodated the spike in capacity requirements by increasing throughput by 40%. The HVLV is projected to operate in the USA for six months. At that time, the HVLV will be reinstalled back in Mexico for the launch of a new casting program. Godfrey & Wing’s HVLV is the only system that can meet these demands with ease. The company found great value in operating their vacuum impregnation equipment as a flexible, portable system. The company now considers this HVLV not tied to a specific program, but rather as a piece of its infrastructure. That HVLV will now be sent to whichever location that has capacity issues.